The map has been published in History National Geographic Magazine Issue 4 . Transcontinental railroads in and near the United States by 1887. A transcontinental railroad is a contiguous network of railroad trackage that crosses a continental land mass with terminals at different oceans or continental borders. Such networks can be via the tracks of either a single railroad, or over those owned or controlled by multiple railway companies along a continuous route. Although Europe is crisscrossed by railways, the railroads within Europe are usually not considered transcontinental, with the possible exception of the historic Orient Express. Transcontinental railroads helped open up unpopulated interior regions of continents to exploration and settlement that would not otherwise have been feasible. In many cases they also formed the backbones of cross-country passenger and freight transportation networks. The ceremony for the driving of the "Last Spike" the joining of the tracks of the CPRR and UPRR grades at Promontory Summit, Utah, on May 10, 1869, Andrew J. Russell’s “East and West Shaking Hands at Laying of Last Rail.” May 10, 1869. A transcontinental railroad in the United States is any continuous rail line connecting a location on the U.S. Pacific coast with one or more of the railroads of the nation's eastern trunk line rail systems operating between the Missouri or Mississippi Rivers and the U.S. Atlantic coast. The first concrete plan for a transcontinental railroad in the United States was presented to Congress by Asa Whitney in 1845. A series of transcontinental railroads built over the last third of the 19th century created a nationwide transportation network that united the country by rail. The first of these, the 3,103 km (1,928 mi) "Pacific Railroad", was built by the Central Pacific Railroad and Union Pacific Railroad to link the San Francisco Bay at Alameda, California, with the nation's existing eastern railroad network at Council Bluffs, Iowa/Omaha, Nebraska, thereby creating the world's first transcontinental railroad when it opened in 1869. Its construction was made possible by the US government under Pacific Railroad Acts of 1862, 1864, and 1867. The world's First Transcontinental Railroad was built between 1863 and 1869 to join the eastern and western halves of the United States. Begun just before the American Civil War, its construction was considered to be one of the greatest American technological feats of the 19th century. Known as the "Pacific Railroad" when it opened, this served as a vital link for trade, commerce, and travel and opened up vast regions of the North American heartland for settlement. Shipping and commerce could thrive away from navigable watercourses for the first time since the beginning of the nation. Much of this route, especially on the Sierra grade west of Reno, Nevada, is currently used by Amtrak's California Zephyr, although some parts have been rerouted. The transcontinental railroad provided fast, safe, and cheap travel. The fare for a one-week trip from Omaha to San Francisco on an emigrant sleeping car was about for an adult. It replaced most of the far slower and more hazardous stagecoach lines and wagon trains. The number of emigrants taking the Oregon and California Trails declined dramatically. The sale of the railroad land grant lands and the transport provided for timber and crops led to the rapid settling of the "Great American Desert". The Union Pacific recruited laborers from Army veterans and Irish immigrants, while most of the engineers were ex-Army men who had learned their trade keeping the trains running during the American Civil War. The Central Pacific Railroad faced a labor shortage in the more sparsely settled West. It recruited Cantonese laborers in China, who did prodigious work building the line over and through the Sierra Nevada mountains and then across Nevada to their meeting in northern Utah. 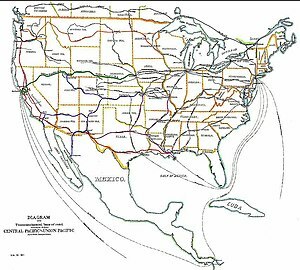 One motive for the Gadsden Purchase of land from Mexico in 1853 was to obtain suitable terrain for a southern transcontinental railroad, as the southern portion of the Mexican Cession was too mountainous. The Southern Pacific Railroad was completed in 1881. The Pacific Railroad Act of 1862 (based on an earlier bill in 1856) authorized land grants for new lines that would "aid in the construction of a railroad and telegraph line from the Missouri river to the Pacific ocean". The first permanent, continuous line of railroad track from coast to coast was completed 15 months later on August 15, 1870, by the Kansas Pacific Railroad near its crossing of Comanche Creek at Strasburg, Colorado. This route connected to the eastern rail network via the Hannibal Bridge across the Missouri River at Kansas City completed June 30, 1869, passed through Denver, Colorado, and north to the Union Pacific Railroad at Cheyenne, Wyoming, making it theoretically possible for the first time to board a train at Jersey City, New Jersey, travel entirely by rail, and step down at the Alameda Wharf on San Francisco Bay in Oakland. This singularity existed until March 25, 1873 when the Union Pacific constructed the Missouri River Bridge in Omaha. March 8, 1881: the SP met the Rio Grande, Mexico and Pacific Railroad (a subsidiary of the Atchison, Topeka and Santa Fe Railway) with a "silver spike" ceremony at Deming, New Mexico, connecting Atchison, Kansas, to Los Angeles. December 15, 1881: the SP met the Texas and Pacific Railway (T&P) at Sierra Blanca, Texas, connecting eastern Texas to Los Angeles. January 12, 1883: the SP completed its own southern section, meeting its subsidiary Galveston, Harrisburg and San Antonio Railway at the Pecos River in Texas, and linking New Orleans to Los Angeles. In Colorado, the 3-foot gauge Denver & Rio Grande (D&RG) extended its route from Denver via Pueblo across the Rocky Mountains to Grand Junction in 1882. In central Utah, the D&RG acquired a number of independent narrow gauge companies, which were incorporated into the first (1881-1889) Denver and Rio Grande Western Railway (D&RGW). Tracks were extended north through Salt Lake City, while simultaneously building south and eastward toward Grand Junction. The D&RG and the D&RGW were linked on March 30, 1883, the extension to Ogden (where it met the Central Pacific) was completed on May 14, 1883, and through traffic between Denver and Ogden began a few days later. The break of gauge made direct interchange of rolling stock with standard gauge railroads at both ends of this bridge line impossible for several years. The D&RG in 1887 began rebuilding its mainline in standard gauge, including a new route and tunnel at Tennessee Pass. The first D&RGW was reincorporated as the Rio Grande Western (RGW) in June 1889 and immediately began the conversion of track gauge. Standard gauge operations linking Ogden and Denver were completed on November 15, 1890. The Atlantic and Pacific Railroad completed its route connecting the AT&SF at Albuquerque, New Mexico, via Flagstaff, Arizona, to the Southern Pacific at Needles, California, on August 9, 1883. The SP line into Los Angeles was leased by the A&P in 1884 (and purchased in 1911); this gave the AT&SF (the A&P's parent company) a direct route into Los Angeles. This route now forms the western portion of BNSF's Southern Transcon. The Northern Pacific Railway (NP) completed the fifth independent transcontinental railroad on August 22, 1883, linking Chicago with Seattle. The Completion Ceremony was held on September 8, 1883, with former U.S. President Ulysses S. Grant contributing to driving the Final Spike. The California Southern Railroad (chartered January 10, 1882) was completed from National City on San Diego Bay via Temccula Cañon to Colton and San Bernardino in September, 1883, and extended through the Cajon Pass to Barstow, a junction of the Atlantic and Pacific Railroad, in November, 1885. In September, 1885, the line of the Southern Pacific from Colton to Los Angeles, a distance of 58 miles, had been leased by the California Central with equal rights and privileges thus allowing the Santa Fe's Transcontinental route to be completed by the connection with the California Southern and A&PRR. The SP grade was used until the completion of the California Central's own line between San Bernardino and Los Angeles in June, 1887, a distance of 62.84 miles, which was part of the old Los Angeles and San Gabriel Valley Railroad, which had been acquired by purchase. In August, 1888, the California Central completed its Coast Division south from Los Angeles to a junction with the California Southern Railroad near Oceanside, a distance of 80.90 miles, and these two divisions comprised the main line of the California Central, forming, in connection with the California Southern, a direct line between Southern California and the East by way of the Atlantic and Pacific and Atchison, Topeka, and Santa Fe Railroads. The Great Northern Railway was built, without federal aid, by James J. Hill in 1893; it stretched from St. Paul to Seattle. The Chicago, Rock Island & Pacific reached Santa Rosa, New Mexico, from the east in late 1901, shortly before the El Paso & Northeastern arrived from the southwest. The two were connected on February 1, 1902, thus forming an additional link between the Midwest and southern California. Through passenger service was provided by the Golden State Limited (Chicago—Kansas City—Tucumcari—El Paso—Los Angeles) jointly operated by the Rock Island and the Southern Pacific (EP&NE's successor) from 1902 to 1968. The San Pedro, Los Angeles & Salt Lake Railroad completed its line connecting Los Angeles through Las Vegas to Salt Lake City on May 1, 1905. Through passenger service from Chicago to Los Angeles was provided by Union Pacific's Los Angeles Limited from 1905 to 1954, and the City of Los Angeles from 1936 to 1971. The Western Pacific Railway (WP), financed by the Denver & Rio Grande on behalf of the Gould System, completed its new line from Oakland to Ogden in 1909, in direct competition with the Southern Pacific’s existing route. Through passenger service (Oakland-Salt Lake City-Denver-Chicago) was provided by the Exposition Flyer 1939 to 1949 and its successor, the California Zephyr 1949 to 1970, both jointly operated by the WP, the D&RGW and the Chicago, Burlington & Quincy. In 1909, the Chicago, Milwaukee & St. Paul (or Milwaukee Road) completed a privately built Pacific extension to Seattle. On completion, the line was renamed the Chicago, Milwaukee, St. Paul and Pacific. Although the Pacific Extension was privately funded, predecessor roads did benefit from the federal land grant act, so it cannot be said to have been built without federal aid. John D. Spreckels completed his privately funded San Diego and Arizona Railway in 1919, thereby creating a direct link (via connection with the Southern Pacific lines) between San Diego, California and the Eastern United States. The railroad stretched 238 km (148 mi) from San Diego to Calexico, California, of which 71 km (44 mi) were south of the border in Mexico. In 1993, Amtrak's Sunset Limited daily railroad train was extended eastward to Miami, Florida, later rerouted to Orlando, making it the first regularly-scheduled transcontinental passenger train route in the United States to be operated by a single company. Hurricane Katrina cut this rail route in Louisiana in 2005. The train now runs from Los Angeles to New Orleans. George J. Gould attempted to assemble a truly transcontinental system in the 1900s. The line from San Francisco, California, to Toledo, Ohio, was completed in 1909, consisting of the Western Pacific Railway, Denver and Rio Grande Railroad, Missouri Pacific Railroad, and Wabash Railroad. Beyond Toledo, the planned route would have used the Wheeling and Lake Erie Railroad (1900), Wabash Pittsburgh Terminal Railway, Little Kanawha Railroad, West Virginia Central and Pittsburgh Railway, Western Maryland Railroad, and Philadelphia and Western Railway, but the Panic of 1907 strangled the plans before the Little Kanawha section in West Virginia could be finished. The Alphabet Route was completed in 1931, providing the portion of this line east of the Mississippi River. With the merging of the railroads, only the Union Pacific Railroad and the BNSF Railway remain to carry the entire route. 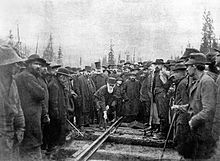 The completion of Canada's first transcontinental railroad with the driving of the Last Spike at Craigellachie, British Columbia, on November 7, 1885, is an important milestone in Canadian history. Between 1881 and 1885, the Canadian Pacific Railway (CPR) completed a line that spanned from the port of Montreal to the Pacific coast, fulfilling a condition of British Columbia's 1871 entry into the Canadian Confederation. The City of Vancouver, incorporated in 1886, was designated the western terminus of the line. The CPR became the first transcontinental railway company in North America in 1889 after its International Railway of Maine opened, connecting CPR to the Atlantic coast. The construction of a transcontinental railroad strengthened the connection of British Columbia and the Northwest Territories to Canada they had recently joined, and acted as a bulwark against potential incursions by the United States. Subsequently, two other transcontinental lines were built in Canada: the Canadian Northern Railway (CNoR) opened another line to the Pacific in 1912, and the combined Grand Trunk Pacific Railway (GTPR)/National Transcontinental Railway (NTR) system opened in 1917 following the completion of the Quebec Bridge, although its line to the Pacific opened in 1914. The CNoR, GTPR, and NTR were nationalized to form the Canadian National Railway, which currently is now Canada's largest transcontinental railway, with lines running all the way from the Pacific Coast to the Atlantic Coast. The first railroad to directly connect two oceans (although not by crossing a broad "continental" land mass) was the Panama Rail Road. Opened in 1855, this 77 km (48 mi) line was designated instead as an "inter-oceanic" railroad crossing Central America at its narrowest point, the Isthmus of Panama, when that area was still part of Colombia. (Panama split off from Colombia in 1903 and became the independent nation of Panama). By spanning the isthmus, the line thus became the first railroad to completely cross any part of the Americas and physically connect ports on the Atlantic and Pacific Oceans. Given the tropical rain forest environment, the terrain, and diseases such as malaria and cholera, its completion was a considerable engineering challenge. The construction took five years after ground was first broken for the line in May, 1850, cost eight million dollars, and required more than seven thousand workers drawn from "every quarter of the globe." This railway was built to provide a shorter and more secure path between the United States' East and West Coasts. This need was mainly triggered by the California Gold Rush. Over the years the railway played a key role in the construction and the subsequent operation of the Panama Canal, due to its proximity to the canal. Currently, the railway operates under the private administration of the Panama Canal Railroad Company, and its upgraded capacity complements the cargo traffic through the Panama Canal. A second Central American inter-oceanic railroad began operation in 1908 as a connection between Puerto San José and Puerto Barrios in Guatemala, but ceased passenger service to Puerto San José in 1989. A third Central American inter-oceanic railroad began operation in 1910 as a connection between Puntarenas and Limón in 1,067 mm (3 ft 6 in) gauge. It currently (2019) sees no passenger service. FERISTSA – a proposed standard gauge (1,435 mm (4 ft 8 1⁄2 in)) north-south line. There is activity to revive the connection between Valparaíso and Santiago in Chile and Mendoza, Argentina, through the Transandino project. Mendoza has an active connection to Buenos Aires. The old Transandino began in 1910 and ceased passenger service in 1978 and freight 4 years later. Technically a complete transcontinental link exists from Arica, Chile, to La Paz, Bolivia, to Buenos Aires, but this trans-Andean crossing is for freight only. On December 6, 2017 the Brazilian President Terner and his Bolivian counterpart Morales signed an agreement for an Atlantic - Pacific railway. The construction will start in 2019 and will be finished in 2024. The new railway is planned to be 3750 km in length. There are two possible tracks in discussion: Both have an Atlantic end in Santos, Brazil but the Pacific ends are in Ilo, Peru and Matarani, Peru. Another longer Transcontinental freight-only railroad linking Lima, Peru, to Rio de Janeiro, Brazil is under development. The first transcontinental railroad in Europe, that connected the North Sea of the English Channel with the Mediterranean Sea, was a series of lines that included the Paris–Marseille railway, in service 1856. Multiple railways north of Paris were in operation at that time, such as Paris–Lille railway and Paris–Le Havre railway. The second connection between the seas of Northern Europe and the Mediterranean Sea, was a series of lines finalized in 1857 with the Austrian Southern Railway, Vienna–Trieste. There were before that railroad connections Hamburg–Berlin–Wroclaw–Vienna (including Berlin–Hamburg Railway, Berlin–Wrocław railway, Upper Silesian Railway and Emperor Ferdinand Northern Railway). The Baltic Sea was also connected through the Lübeck–Lüneburg railway. The first Eurasian transcontinental railroad was the Trans-Siberian railway (with connecting lines in Europe), completed in 1905 which connects Moscow with Vladivostok on the Pacific coast. There are two connections from this line to China. It is the world's longest rail line at 9,289 km (5,772 mi) long. This line connects the European railroad system with China, Mongolia and Korea. Since the former Soviet countries and Mongolia use a broader gauge, a break of gauge is necessary either at the eastern frontiers of Poland, Slovakia, Hungary and Romania or the Chinese border. In spite of this there are through services of passenger trains between Moscow and Beijing or through coaches from Berlin to Novosibirsk. Almost every major town along the Trans-Siberian railway has its own return service to Moscow. 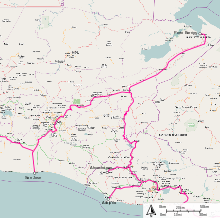 A second rail line connects Istanbul in Turkey with China via Iran, Turkmenistan, Uzbekistan and Kazakhstan. This route imposes a break of gauge at the Iranian border with Turkmenistan and at the Chinese border. En route there is a train ferry in eastern Turkey across Lake Van. The European and Asian parts of Istanbul are linked by a train ferry, and an undersea tunnel is under construction. There is no through service of passenger trains on the entire line. A uniform gauge connection was proposed in 2006, commencing with new construction in Kazakhstan. A decision to make the internal railways of Afghanistan 1,435 mm (4 ft 8 1⁄2 in) gauge potentially opens up a new standard gauge route to China, since China abuts this country. The Trans-Asian Railway is a project to link Singapore to Istanbul and is to a large degree complete with missing pieces primarily in Myanmar. The project has also linking corridors to China, the central Asian states, and Russia. This transcontinental line unfortunately uses a number of different gauges, 1,435 mm (4 ft 8 1⁄2 in), 1,676 mm (5 ft 6 in), 1,520 mm (4 ft 11 27⁄32 in) and 1,000 mm (3 ft 3 3⁄8 in), though this problem may be lessened with the use of variable gauge axle systems such as the SUW 2000. The TransKazakhstan Trunk Railways project by Kazakhstan Temir Zholy will connect China and Europe with standard gauge 1,435 mm (4 ft 8 1⁄2 in). Construction is set to start in 2006. Initially the line will go to western Kazakhstan, south through Turkmenistan to Iran, then to Turkey and Europe. A shorter to-be-constructed 1,435 mm (4 ft 8 1⁄2 in) link from Kazakhstan is considered going through Russia and either Belarus or Ukraine. The first Trans-Australian Railway was completed in 1917, between Port Augusta and Kalgoorlie, and crosses the Nullarbor Plain. This line completed the link between the mainland state capitals of Brisbane then Sydney via Melbourne and Adelaide to the western state capital of Perth. This route suffered from a number of breaks-of-gauge, using 1,435 mm (4 ft 8 1⁄2 in) twice, 1,600 mm (5 ft 3 in) once, and 1,067 mm (3 ft 6 in) thrice, with five breaks-of-gauge in all. The Trans-Australian Railway was the first route operated by the Federal Government. In the 1940s, 1970s, and 2000s steps were taken to rationalise the gauge chaos and connect the mainland capital cities mentioned above with standard gauge 1,435 mm (4 ft 8 1⁄2 in). Since 1970, when the direct standard gauge line across the country was completed, the passenger train on the Sydney to Perth line has been called the Indian Pacific. The proposed Iron Boomerang would connect iron in the Pilbara with coal in Queensland, so achieving loaded operations in both directions. A 1,320 km (820 mi) land grant railway from Charleville to Point Parker on the Gulf of Carpentaria, with branches, was proposed in the 1880s. The first north-south trans-Australia railway opened in January 2004 and links Darwin to Adelaide with the Ghan passenger train. The Adelaide-Darwin railway is standard or 1,435 mm (4 ft 8 1⁄2 in) gauge, though the original line to Alice Springs (never fully completed line) was 1,067 mm (3 ft 6 in) gauge. In 2006, proposals for new lines in Queensland that would carry both intrastate coal traffic and interstate freight traffic would see standard gauge penetrate the state in considerable stretches for the first time. (ARHS Digest September 2006). 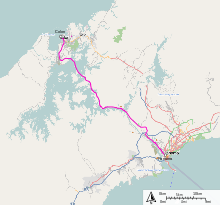 The standard gauge Inland Railway would ultimately extend from Melbourne to Cairns. Starting in 1867, Queensland built several railways going inland from several ports in a westerly direction. From the 1920s, steps were taken to connect these lines by the North-South North Coast line from Brisbane to Cairns. There are several ways to cross Africa transcontinentally by connecting west-east railroads. One is the Benguela railway that was completed in 1929. It starts in Lobito, Angola and connects through Katanga to the Zambia railways system. From Zambia several ports are accessible on the Indian Ocean: Dar es Salaam in Tanzania through the TAZARA, and, through Zimbabwe, Beira and Maputo in Mozambique. The Angolan Civil War has made the Benguela line largely inoperative, but efforts are being taken to restore it. Another west-east corridor leads from the Atlantic harbours in Namibia, either Walvis Bay or Luderitz to the South African rail system that, in turn, links to ports on the Indian Ocean ( i.e. Durban, Maputo). A 1015 km gap in the east-west line between Kinshasa and Ilebo filled by riverboats could be plugged with a new railway. There are two proposals for a line from the Red Sea to the Gulf of Guinea, including TransAfricaRail. In 2010 a proposal surfaced to link Dakar to Port Sudan. Thirteen countries are on the main route, while another six would be served by branches. A North-South transcontinental railroad had been proposed by Cecil Rhodes: the Cape-Cairo railway. This system was seen as the backbone for the African possessions of the British Empire, and was not completed. During its development, a competing French colonial project for a competing line from Algiers or Dakar to Abidjan was abandoned after the Fashoda incident. This line would have had four gauge islands in three gauges. An extension of Namibian Railways is being built in 2006 with the possible connection to Angolan Railways. Libya has proposed a Trans-Saharan Railway connecting possibly to Nigeria which would connect with the proposed AfricaRail network. The African Union of Railways has plans to connect the various railways of Africa including the Dakar-Port Sudan Railway. ^ Bain, David Haward (1999). Empire Express; Building the first Transcontinental Railroad. Viking Penguin. ISBN 0-670-80889-X. ^ Collins, R.M. (2010). Irish Gandy Dancer: A tale of building the Transcontinental Railroad. Seattle: Create Space. p. 198. ISBN 978-1-4528-2631-8. ^ "Ceremony at "Wedding of the Rails," May 10, 1869 at Promontory Point, Utah". World Digital Library. 1869-05-10. Retrieved 2013-07-21. ^ Fink, Robert (July 27, 1970). "National Register of Historic Places Inventory – Registration Form: Comanche Crossing of the Kansas Pacific Railroad". NP Gallery. National Park Service. Retrieved September 9, 2016. ^ Borneman, Walter R. (2014-11-18). Iron Horses: America's Race to Bring the Railroads West. Little, Brown. ISBN 9780316371797. ^ Beebe, Lucius and Clegg, Charles, “Rio Grande, Mainline of the Rockies”, Howell-North Books 1962. ^ "A Great Enterprise" The Portland (Maine) Transcript [Newspaper], February 17, 1855. Glenn Williamson, Iron Muse: Photographing the Transcontinental Railroad. Berkeley, CA: University of California Press, 2013.